All industries develop special certifications to ensure its employees have a thorough knowledge of the tools of their trade. At SunPower by Alternative Energy Systems, we place high value on the comprehensive set of skills required for designing solar energy systems to meet customer needs, and we take pride in the knowledge and expertise of our team. Earning a professional certification through The North American Board of Certified Energy Practitioners (NABCEP) is one such method through which individuals may receive extensive training and experience working with renewable energy. We are proud our company has more NABCEP-certified staff members than most solar companies in California. In particular, our entire design team is certified, essential to our delivering unparalleled solar systems. NABCEP is a non-profit corporation founded in 2002 designed to teach professionals about renewable energy. They offer multiple programs for professional certification in technical sales, heating installation, as well as solar installation. These certifications and tests have been accredited by the ISO/IEC 17024 standard by the American National Standards Institute. The various programs offer training in order to prepare professionals for sitting exams in solar energy practices. In doing so, the courses provide entry level knowledge assessments and professional certifications throughout North America. NABCEP is the most widely recognized, and most respected, solar professional certification organization in all of North America. The NABCEP Photovoltaic Associate Program is the entry level program designed to teach candidates the basic principles of application, design, installation, and operation of energy systems. This knowledge applies to both grid-tied and stand-alone Photovoltaic (PV) systems. 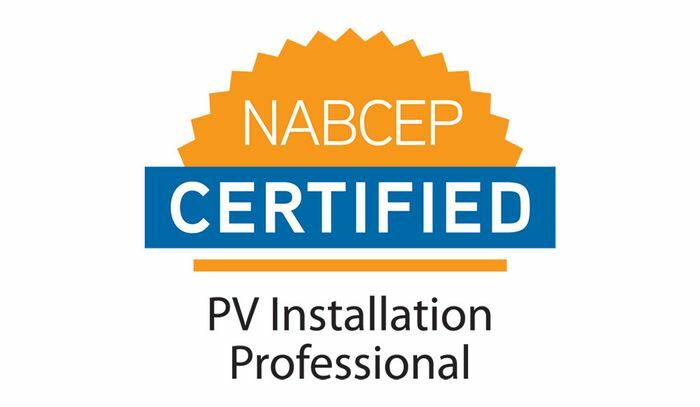 After passing the exam following this program, most candidates will go on to become certified solar panel installers, which the NABCEP offers through their PV Installation Professional Certification program. For individuals who wish to seek more knowledge about alternative energy systems, the NABCEP also offers a PV Technical Sales Certification and CABCEP Solar Heating Associate Exam and Installer Certification. The sales certification teaches typical skills and knowledge useful for solar panel salespersons, including site analysis, system design, ethical presentation, and projections of system performances regarding electrical, environmental, and financial aspects. Candidates looking to work with solar heating systems, the Heating Associate Exam and Installer Certification teaches all necessary skills regarding the field and is particularly helpful for contractors, foremen, supervisors, and journeymen. To learn more about the programs and exams at NABCEP, click here. At SunPower by Alternative Energy Systems, we recognize the importance of keeping our employees up-to-date on the latest trends and knowledge pertaining to the solar energy industry. The more we know, the better we can serve you and meet the needs of your home or business. For that reason, we are proud to say we employee more NABCEP certified employees than most solar companies in the surrounding area. To learn more about solar energy, contact SunPower by Alternative Energy Systems for a free estimate.